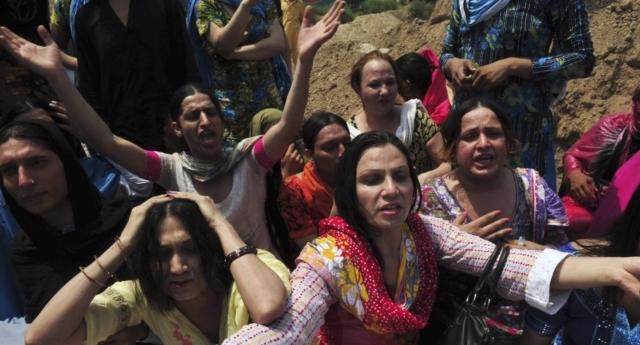 A transgender person has been shot dead in the city of Peshawar in Pakistan. The victim, identified as Nasir Naso, was killed near Bara Gate after being tortured, police said. Officials said the victim was discovered in a sack in the area, according to local reports. Two suspects have been arrested, one of whom is the owner of the victim’s house, police confirmed. Trans Action Pakistan condemned the murder, which is the 62nd killing of a trans person in the Khyber Pakhtunkhwa region since 2015. Violence and discrimination towards trans people in the country remains a problem in the country, but moves are being made to strengthen trans rights legally. Earlier this year Pakistan introduced historic legislation protecting trans people from discrimination in employment, healthcare, housing and on public transport. Pakistan issued its first passports with a separate gender X category last year, which allows trans citizens to self-identify with a third option instead of just male or female. Five transgender women ran in Pakistan’s general election, which is the highest ever number of trans nominees in the conservative country. Dr Qasim Iqbal, executive director of NAZ, Pakistan’s leading organisation working for the health and human rights of sexual and gender minorities, told the Human Rights Campaign: “The law signals a recognition on the part of the Government of Pakistan that transgender persons are our sisters, brothers, friends, and that they have to be treated like every other Pakistani. There are still significant challenges, though, with trans people reportedly being blocked from voting in the election. According to local media, dozens of people in the Khyber Pakhtunkhwa region have been barred from casting their vote because their identification cards did not match their gender identity. Some trans voters who had updated their ID – including to the gender X category – were also prevented from casting their vote.